Global number one business incubator network the SETsquared Partnership, which is backed by the University of Bristol, has boosted its services to scale-ups by starting an online investment platform. Founded in 2002 and also backed by the universities of Bath, Exeter, Southampton and Surrey, SETsquared has traditionally run bespoke programmes that supports the earliest stage of a start-up’s life. 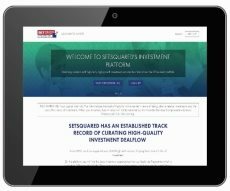 its Envestry fundraising platform, SETsquared’s start-ups will get a personalised site to promote deals, raise finance and engage with investors 24 hours a day, 365 days a year.